This is the top-of-the-line very high-gloss (wet-look) exterior grade sealer. The very glossy finish brightens the natural coloration of aggregates and stone, enhancing their architectural and esthetic qualities with a lustrous seal and durable finish. Generally, this high-gloss look darkens the appearance somewhat (like water on it). Clear Seal High Solids sealer reduces the damage caused by salt, water, UV Light, and is highly resistant to oils and most chemicals (safe around the pool). Clear Seal High Solids is 26% solids and a solvent-acrylate based sealer for interior or exterior concrete that can be applied both vertically and horizontally. most other siliceous material. WE RECOMMEND TO TEST PRODUCT BEFORE USING. SURFACE PREPARATION & APPLICATION: READ INSTRUCTIONS FOR DETAILS. Summary - Remove all dirt, dust, oil, grease, asphalt, and foreign mater. Restore surfaces as needed by patching, grouting, and filling cracks and holes. Surface should be thoroughly dry and free of any moisture. Care should be taken when applying to colored concrete. Test a small area for compatibility FIRST. Make sure surface is fully cured or coating failure, chalking, and adhesion problems will occur. Apply Clear Seal to form a continuous, THIN, uniform film by spray or with a short-nap phenolic core roller. Do not puddle material. If using a sprayer it should have neoprene seals and hose. Clean skin with soap and water. Clean all tools immediately after use with Xylene. Do not apply under windy conditions or in temperatures above 90F or temperatures below 45F. COVERAGE: Coverage will vary with texture and porosity of surface. Apply at a rate of 250 to 300 sq.ft. per gallon for the 1st coat application and 300 - 400 square feet per gallon for additional coats (very thin). Apply two coats for higher gloss and three coats for super gloss. DO NOT APPLY TOO THICK. 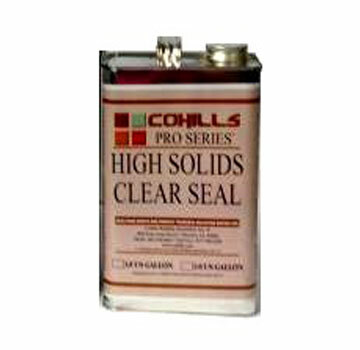 Clear Seal HS are high solids coatings. Over applying the sealer may result in bubbling, milky-ness, coating imperfections, finish variations and wasted material. CURE: Clear Seal Sealer will be ready for light foot traffic or second coat in approximately 1 hour, normal traffic within 4 - 8 hours and will achieve maximum hardness after 24 hours. CAUTIONS: READ MSDS SHEET AND INSTRUCTIONS BEFORE USE. FLAMMABLE LIQUID . * Recommended for use only by professionals. * Never apply around heat sources such as water heaters, furnaces, etc. * Use rubber gloves and safety glasses. * Use in well ventilated areas only. * Prior to use or handling of material consult Material Safety Data Sheet. * If spraying or using indoors, wear a NIOSH/MSHA approved ORGANIC vapor respirator. VOC COMPLIANCE: Cohills Clear Sealer meets and exceeds VOC rules as written under the Clean Air Act. Contains less than 5.8 pounds per gallon/700 grams per liter Volatile Organic Compounds as required for a Concrete Cure and Seal Ready to use. No mixing required. Shipping Information is as follows: Coating Solution, 3, UN1139, PG II, Flammable Liquid.